The Wild Olive Cottage is one of our most popular family holiday cottages. The cottage has a beautiful view with a large garden that includes established trees. Furthermore, the cottage is semi-self catering, and perfect if you want to braai outside. A country retreat close to Johannesburg suitable for those with limited mobility. For more information about the Wild Olive Cottage or to book your stay, please contact us. 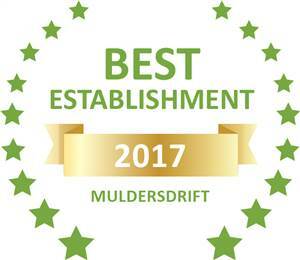 Based on reviews of establishments, Random Harvest Country Cottages has been voted Best Establishment in Muldersdrift for 2017. If you’re a parent looking for guest house accommodation in Muldersdrift, then Random Harvest is the perfect place for you. Our farm style cottages are cosy, easy to access and will provide you and your little ones with all the comfort you need for a relaxing weekend away.